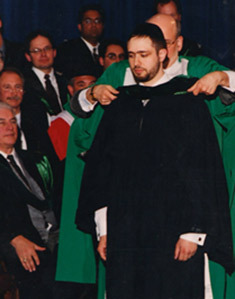 I graduated from the Canadian Memorial Chiropractic College in May 2002. Two of my internships were in their Specialty Clinics, Muki Baum Children’s Treatment Centre, working with children who had significant developmental and physical disabilities and the Donwood Institute (merged with CAMH) which worked to rehabilitate severe drug and alcohol addicts. I followed up my Chiropractic studies with a 9 month Acupuncture course with Dr. Patrick Anthony focusing on pain management, addiction and mental stress. I started practicing, after being Board certified both in Canada and the United States, in 2003. I was very fortunate to meet and co-manage patient care with Dr. Alvin Pettle MD, FRCS – the former Chief of Obstetrics and Gynecology at Etobicoke General. This is particularly meaningful to me as Dr. Pettle is considered to be a pioneer in Integrative Medicine, specifically in the area of Bioidentical Hormone Replacement Therapy. The majority of patient’s we co-manage are peri-menopausalor menopausal females who are experiencing symptoms like headaches, back pain and anxiousness or have been diagnosed with such conditions as fibromyalgia, chronic fatigue syndrome and adrenal fatigue. Over the years I came to realize the importance posture plays in people’s health and in general patient care.Posture is not only about how we look, (although we know how much more impressive you look standing straight), it also plays a major role in our body’s everyday function. Did you know that spinal nerves go directly to your major organs? So when spinal tissues are being chronically stretched and pulled due to poor posture it’s going to have an effect on health and function. Studying postural design and improvement became a goal of mine and in 2016 I was excited to be invited to join the team at ANPTH to provide general family care and to head their posture division. The patient care I provide consists of a combination of tonal gentle adjustments, acupuncture, posture exercises, and lifestyle modification. Tonal adjustments are very light impulses that release tension along the spinal cord caused by subluxations of the bones of the spine. This gently allows your spine to achieve a state of correction, creating a healthier nervous system with positive ramifications to the health of the whole body and mind. Since the nervous system controls all functions of the body it is vital that it runs efficiently as possible.